Delhi to Kathmandu in Nepal is a popular side trip from India (many people also make the journey from Varanasi to Kathmandu). Here are the best options for travel from Delhi to Kathmandu, depending on budget. If you don't mind spending the money, the quickest and easiest way is to fly. 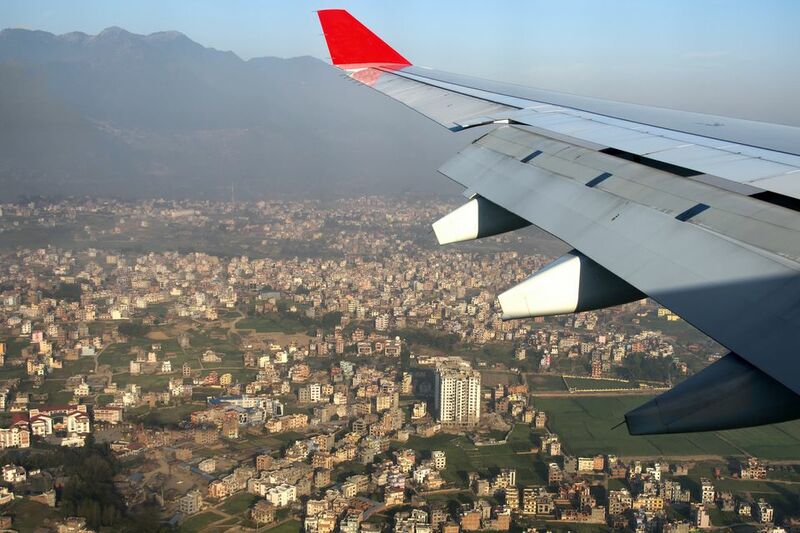 Five different airlines, both low cost, and full service operate on the Delhi to Kathmandu route with departures throughout the day. These include Air India, Jet Airways, IndiGo, and Royal Nepal Airways. It's become very competitive, ensuring much lower prices than flying from Varanasi to Kathmandu. Expect to pay around 4,500 rupees including tax for the cheapest fare. Flying time is around an hour and a half. An economical way to travel to from Delhi to Kathmandu is by train to Gorakhpur in Uttar Pradesh, then bus or shared jeep to the border in Sunauli, then another bus or shared jeep to Kathmandu from Bhairahawa on the Nepali side of the border. There are quite a few trains that run from Delhi to Gorakhpur. However, ideally, you'll want one that arrives very early in the morning. That's because it's around three hours by bus from Gorakhpur to the border, and day buses to Kathmandu stop running by late morning (overnight buses leave in the late afternoon and evening, but they take longer to get there and you'll miss the stunning scenery). A bus from the border to Kathmandu will cost about 600 rupees upwards. In regards to trains, the 15708 Amrapali Express departs Delhi daily at 3.30 p.m. and reaches Gorakhpur at 5.45 a.m. It's not unusual for it to arrive a couple of hours late though. (See train details). Another option with slightly earlier departure and arrival times is the 12524 New Delhi - New Jalpaiguri SF Express. It only runs on Sundays and Wednesdays though. And, it's also known to arrive a couple of hours late. (See train details). The fare is 420 rupees in Sleeper Class up to 1,580 rupees in 2AC. Alternatively, the 12558 Sapt Kranti Superfast Express departs daily from Anand Vihar in Delhi at 2.40 p.m. and arrives in Gorakhpur at 3.50 a.m. It only has a few stops, making it a punctual option. (See train details). The Delhi Transport Corporation launched a new direct bus service from Delhi to Kathmandu on November 25, 2014. It departs daily at 10 a.m. from Ambedkar Stadium Bus Terminal at Delhi Gate. The bus is a luxury Volvo bus. It goes via Agra, Kanpur, and the Sunauli border in Uttar Pradesh. Travel time is approximately 30 hours. The one-way fare is 2,300 rupees. While the Sunauli border is the most popular and busiest entry point into Nepal, there is another border crossing that's closer to Delhi, at Banbasa in Uttarakhand. This picturesque rural route is the quickest way from Delhi to Kathmandu if you have your own car (public transport options are available but they're not as plentiful as at the Sunauli border). You can stop off at Bardia National Park in Nepal, about five hours from the border, on the way to Kathmandu. It's well worth it.